When I was a kid growing up on Gilchrist Avenue, there was a small park a few blocks over which my Dad would take my brother and I to. It was a pretty boring park: there was a sandbox, a few swings and a little mysterious hut. The fence was old and rusty, the grass didn't really ever grow, and there were foundations, or some kind of remnants of something exciting that maybe *used* to be there (but certainly wasn't anymore). My Dad had good memories of the park too (having himself grown up on Western Avenue), but by the mid-late 80s, it was minimally tended to, long forgotten in lieu of the larger and more modern parks in the area. Long-time (or former) residents of Wellington Village may remember Grange Park in it's heyday. Perhaps you have good memories of parties or events at the park, when it would have been a central spot for the kids of Wellington Village to play in the 1940s and 50s. By the mid-90s it was officially abandoned, and now a new and modern house stands in its place. It was the fall of 1945 when the alderman for the area (then known as Victoria Ward) Thomas F. Ellis, who was a strong proponent of parks and recreation, suggested that the vacant lot at the southwest corner of Grange Avenue and Scott Street be considered as park space. Ellis was in his first year in his role as alderman, and was active in improving the district. 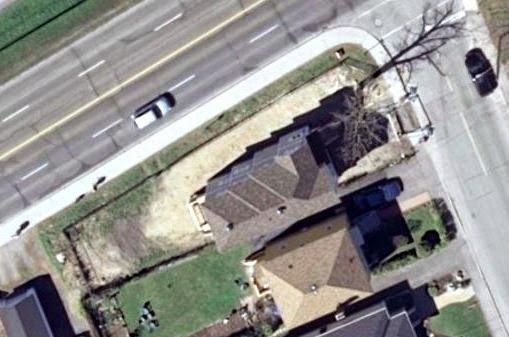 The city had acquired lot 777 on Grange Avenue (along with many others) through foreclosure due to unpaid taxes. The lot had sat empty, as most of the north ends of the streets between Western and Holland had at the time. Construction on most streets had started at the Wellington Street end in the late 20s, and once the depression era hit, largely did not grow much north past Spencer Street. Lots that had been purchased by home-building dreamers and land investors were surrendered to the City due to an accumulation of taxes owing on what had become almost worthless land. Scott Street did not even exist in actuality at the time; at best it was a dusty lane that local residents might use to sneak to the next street over. The CPR train tracks separated Wellington Village from the desolate lands that would one day become Tunney's Pasture, but it was really a vast empty spot. right, while above it are the CP rail tracks. 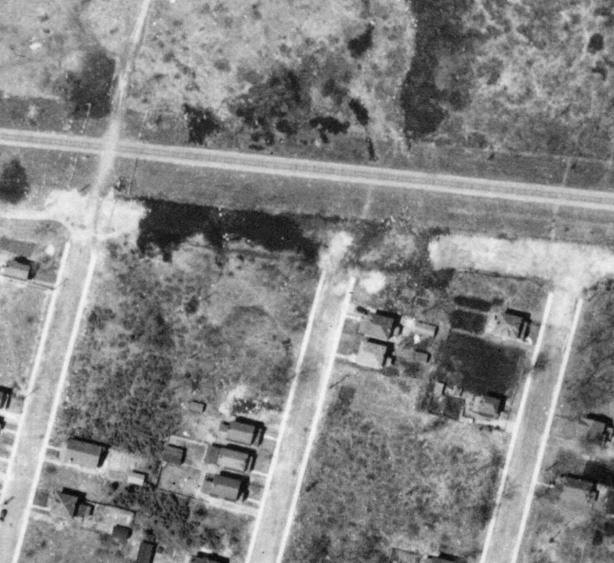 The area perked up around 1940 (surprising, considering WWII was raging at the time), and began to fill in towards Scott Street (which itself would not be paved until 1953!). 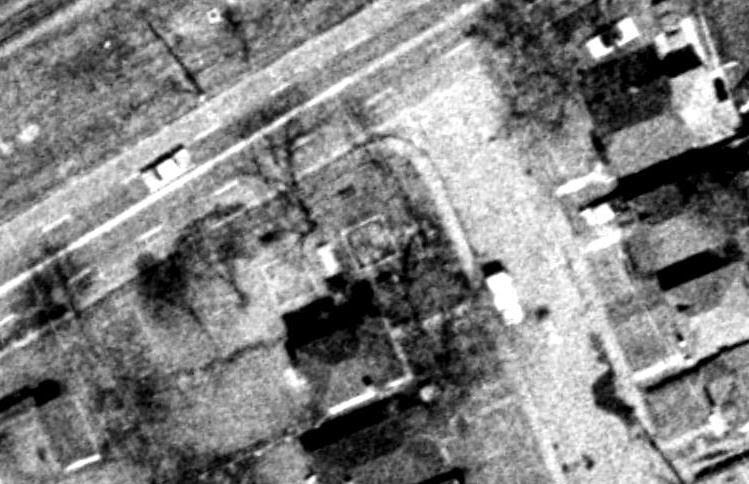 Grange did not have any houses on the west side north of #38 until the early 40s, but houses began to be arrive as builders purchased these lots for as low as $50 from the City (who were keen to see the lots evolve as quickly as possible into tax money-generating properties with houses). Since the city still owned lot 777, Alderman Ellis suggested it as a possible spot for a park. He may have felt the lot was perhaps unsellable, and could not be built on, as it had an odd, triangular shape. But since it had a corner lot location, he perhaps saw that it could be a fair central spot for parkspace, despite its tiny size. 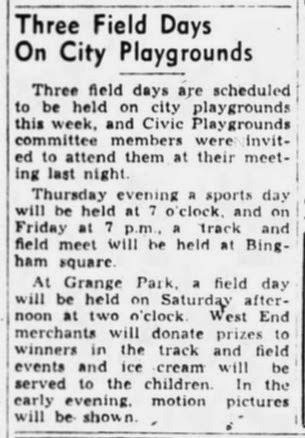 In March of 1946, the announcement in the local papers made it official: Grange Park would open that summer, complete with a wading pool and some playground equipment. Work began in late May of 1946 on two new wading pools in Ottawa, at Grange Park and at Laroche Park on Bayview. 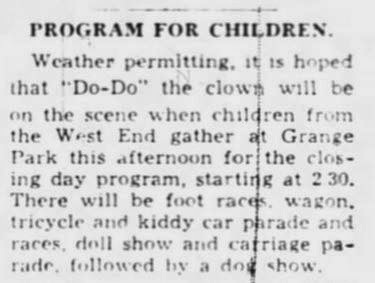 By August of 1946, the park was in full community swing, and several newspaper articles covered some theme days held at the park. 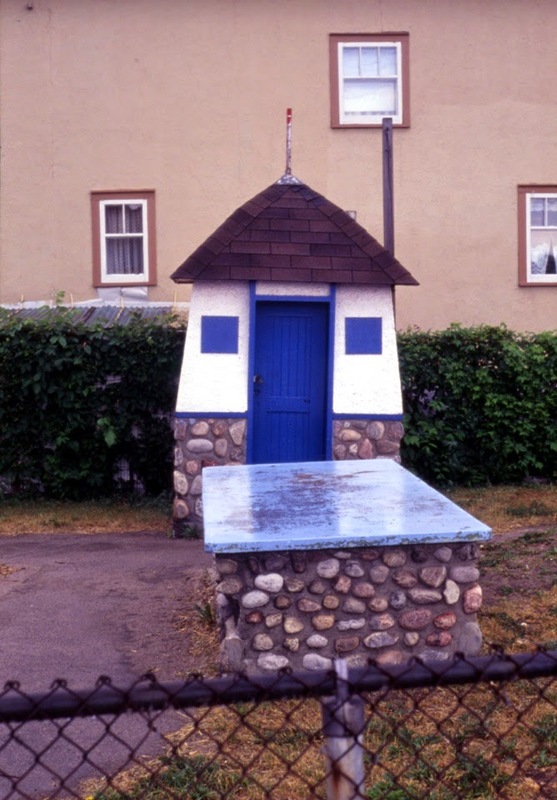 The Ottawa Playgrounds Department (as it was actually known) was responsible for the establishment of these "miniature playgrounds", of which they opened several during the era. Grange Park was considered the first of these "ultra modern playgrounds", where the City would construct the parks, and install required equipment, but the management and care of them were left to the "mothers and children of the neighborhood". The committee promoted that for the long-term benefit of the park, "the small price they would now have to pay for their children's safety was the little bit of care they would have to exercise in seeing that the playground's facilities were kept in good shape.". Chinese Elms were planted in the Park in the early 1950s to add to its charm. An article in 1947 mentioned a planned "field house" to be built, and another from 1949 mentioned a planned "comfort station". Certainly something was built at this time, though it was quite small, basically a little hut, which I'd hesitate to call either a field house or comfort station. Annual events were held between 1946 and the late 1950s. There were popular pet shows, doll shows, tin can derbies, even a "Miss Grange Park" event each year. The end of year party was the most well-attended. I could not believe reading that in 1948, the end of season party (called the "Closing" party), had 600 people attend. They must have been standing on each others shoulders 4-5 people tall to fit that many people into that space! Below is an aerial shot of the park from 1965 (the best I could come up with from the glory days of the park - if anyone has any vintage photos taken at the park, I would absolutely love to see them - and scan one or two!). The wading pool (or pools?) 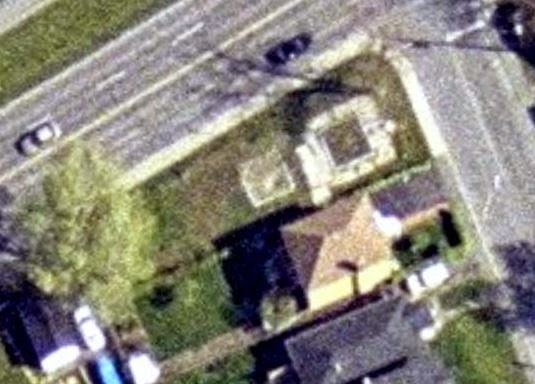 are visible as white-bordered squares, with the little square hut between them (see the photo below for detail on it). It was sometime around the late 50s or early 60s when it seems the park's popularity died off. There was no mention of events at Grange Park in the papers after 1960, though the Citizen in 1970 did joke about the existence of "postage stamp-sized Grange Park, a one-tenth-acre lot complete with wading pool and swings." Grange Park how I remember it - from June of 1991.
covered the pump and works related to the wading pool? In 1996, the City of Ottawa declared the property surplus, and though it took a few years, was sold to a private individual. A zoning change was required, and was reviewed and approved by the Planning and Environment Committee in 2006. The West Wellington Community Association lamented that they had made efforts through the local councillor to save the park for neighbourhood use, in particular as a community garden to be maintained by local residents (which would have been a fantastic idea), but they received little help in this quest, and ultimately, the City sold and rezoned the property. The neighbour across the street, who was also a member of the Ottawa Forests & Greenspace Advisory Committee, made sure as part of the zoning application that the large tree was protected during the process (it was, though it had a huge "X" on it as of this summer, like so many trees in our area). The abandoned park in 2002 - even the sandbox and swings are gone. The new house at 22 Grange Avenue was constructed between 2006-2007, and to the surprise I'm sure of many in the community, a fairly large home fit well into the relatively thin lot. Not to mention, it fit in to the Grange Avenue streetscape quite well also. 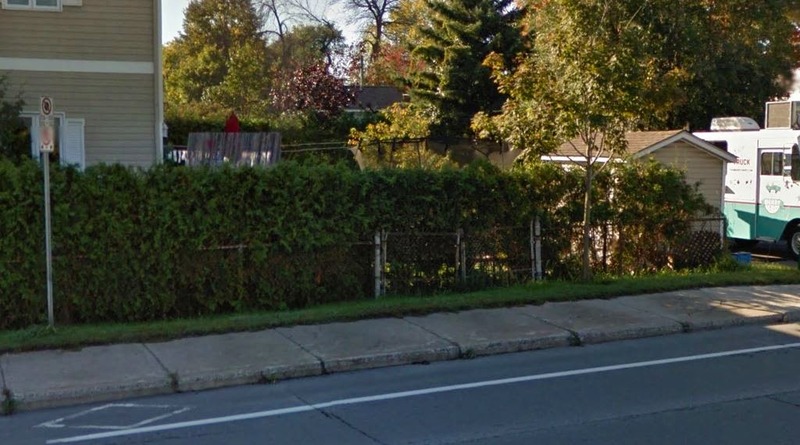 The fence around 22 Grange Avenue which is still there today. The original swinging opening still visible on the Scott Street side. So there you have it - the history of the forgotten Grange Park. Part of the memories of many Wellington Village residents, the product of an era of City planning that prioritized outdoor play in local neighbourhoods. We got away from that for a while, but the pendulum seems to have swung back the other way on this, as small community parks seem to be popping up more regularly now, and that can only be considered a good thing. Since I wrote this post, I have come across a vintage photo taken in the park. Courtesy of the amazing photographic collection of Bruce Chapman, here is a photo from May of 1947, looking east from the park (you can see the short stone hut that is visible in the 1991 photo shown above). Aha! That's the park we used to go to late 50s/early 60s when we went to visit our grandmother who lived on Smirle. I've being trying to look it up recently on Streetview and now I know why I couldn't find it. I would love to see a photo of the park back in its day. I remember going to that park in the late 1970's as a kid and there was a wading pool that eventually became a big sandbox. Great memories. 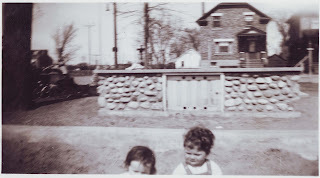 I lived at 5 Smirle from '57 to '64 and a trip to "the park" was a big adventure! Wading pool, swings! When I first heard about a far-away place called Algonquin Park, I thought it was the same size as Grange Park!